Psoriasis is a persistent autoimmune skin disease which is not contagious.It affects both skin and joints of the individual who is affected by the disease. Psoriasis normally causes the skin of the individual to become red and scaly. Normally, these outbreaks are only in patches. These patches caused by psoriasis are called psoriatic plaques. Psoriatic plaques are patches of skin where the skin has become inflamed and there has been an excessive amount of skin production. The skin produced by the body accumulates at these patches and has a white appearance. The patches occur commonly on the skin around elbows and knees. However, many individuals also report outbreaks on their scalp and their genital region. Psoriasis is different from eczema in the aspect that it is more likely to be located on the extensor point of the joint. Psoriasis is a persistent condition, but the severity of psoriasis can vary from each individual. Some individuals report mild psoriasis with just a few small patches, while others report severe cases of psoriasis where their whole body or most of their body is affected by the skin disease. Plaque type psoriasis is the most common form of the disease, affecting 80 to 90 percent of people suffering from the condition. It typically appears as raised areas of inflamed skin covered by white scales. This inflammation causes severe itching, swelling and pain. When located at the joints and connective tissue, this can cause psoriatic arthritis, most commonly in the fingers and toes. 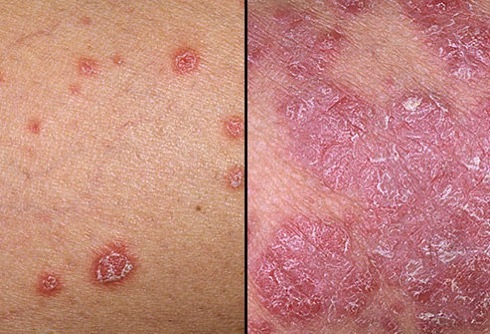 ‘Scalp Psoriasis’ is also very common. Skin showing red scaly patches, a common symptom of Psoriasis.. The disease can range from being MILD to VERY SEVERE! The severity of the disease is calculated by the percentage of its spread over the body and its impact on the life of the patient. It can be determined to be mild, moderate-to-severe, or severe. Itching and pain, which cause irritation and lack of sleep, are only the base effects of Psoriasis. Depending on where the symptoms appear, the condition may have a serious effect on an individual’s quality of life. For instance, if the affected areas include the feet or legs, it can inhibit an individual from walking or doing other physical activities. Psoriasis of the hands and fingers can be occupationally disabling, making it difficult or impossible for a surgeon to do surgery as an example. The condition can also affect a person psychologically, as sufferers may feel embarrassment, depression and social isolation due to how this disease affects their appearance. While there is no psoriasis cure, there are many treatment therapies that can help to alleviate the various symptoms of psoriasis or prevent flare-ups. Many treatment methods include home remedies for psoriasis, implementing a psoriasis diet, light therapy for psoriasis, homeopathy, acupuncture for psoriasis, topical treatments, etc. Taking medications internally is known as systematic therapy. Systematic therapy is usually suggested in cases of moderate to severe psoriasis. As is common with many psoriasis treatments, what works for one patient will not necessarily work for another. This does not mean that a patient should give up on finding treatment that works for him or her. It just means that their search for a treatment regimen that works will take a little longer and they will have to try various combinations of home remedies for psoriasis, light therapy for psoriasis, acupuncture, herbs, topical creams and gels and so forth. There are many topical treatments for Psoriasis as well. Dermatologists prescribe, relevant ointments to prevent flaking, but one very popular OCT ointment is Mg 217. You might have heard about it……. Does it actually help? It is an affordable, temporary solution for Psoriasis. It is composed of coal tar, and has a good moisturising effect on the skin. Since it proved by the National Psoriasis foundation it is trusted and used by many. You may also be one of them. but of course, we do know that every remedy for this disease causes temporaray relief and is not bound to work for all! It may suit one patient while it may be not at all beneficial for the other one. Same is the case with Mg 217. The consumer’s views about it are very ambiguous. Some achieved relief while the others said it caused inflammation and irritation. Psoriasis is a complicated disease to treat, and though there is no specific cure, but the disease can be controlled. A very trusted treatment for this disease is via LIGHT. Phototherapy and psoriasis is nothing new. Patients have been using this treatment, also known as light therapy, for a long time. The earliest forms of phototherapy involved exposure to the sun, as this readily available source of light treatment has no impact on the patient’s pocketbook. For a more controlled environment, patients use phototherapy lamp treatments under the supervision of their doctor. UV light therapy for psoriasis has been shown to be quite effective in the treatment of psoriasis. Of the three types of ultraviolet (UV) light found in sunlight namely UVC, UVA and UVB, UVA and UVB rays are the most beneficial for treating psoriasis. While uv light therapy for psoriasis can be effective using the uv rays alone, it’s effectiveness is greatly increased when other agents whether topical or systematic are used in combination with uv light for psoriasis sufferers. Treatment is UVB light is usually given two to three times a week. During therapy, exposure to UVB must be diligently monitored to prevent sunburn and damage to the skin. Depending on how responsive the skin is to light therapy, results may show in a few weeks with significant clearing taking place in six to eight weeks. The effects of UV light treatment vary from patient to patient. Once the patient has been cleared, the duration of clearance may be three or four months or sometimes significantly longer. Phototherapy and psoriasis is not without risk. As with all forms of skin exposure to a light source, sunlight or otherwise, overexposure can be a problem. Sunburn and other side effects such as melanoma, needs to be avoided at all cost as this will bring on a whole host of other problems. If you are opting for natural sun exposure, be sure to use a sun block on those areas of your body that are not affected by psoriasis. In terms of exposure, the midday sun is the most intense. Be sure to limit your time exposure to a maximum of one hour. You would start at 20-30 minute sessions and increase gradually in 5-10 minute increments. Do not be despaired for treatment of ‘Psoriasis’ with light is possible and can be delivered in a controlled way to provide therapeutic benefits. There are the most trustworthy ‘at home’ use devices which will help you recover more effectively that anything that you’ve tried before! A known name in producing ‘Light therapy’ equipments. Angel Kiss Uv lamp, is also a high quality and user friendly device. Very affordable at home solution for Psoriasis. Bottomline: This is a very ‘affordable’ lamp that will provide to you with benefits of using UV light on the skin. It is popular among consumers for the company is known to produce many other light therapy products too. It can be a the best choice for your skin treatment. UVB midband, is a very dependable and durable UV light source, created for killing disease causing germs. Manufactured by an established manufacturer, ‘Rayminder’. The company claims to heal your skin since UVB light has germicidal properties and UVA light reaches deep into the epidermis and helps in healing. Inbuilt timer shuts the device down in 5 minutes. Bottomline: An affordable and quality product. Customer reviews reveal its efficiency for treating eczema and Psoriasis. It can also be a good option to buy.